Challenged to organize the endless stream of odds and ends in your kitchen? It’s tempting to buy as many organization products as you can (we know, we have…)! But it can result in even more stuff piling up everywhere from the counters to the cabinets… or worse… the floor. Here’s a selection of efficient and multi-use solutions for organizing your cookware, utensils and pantry staples. After all, who has time to create an organization system for all your organization tools? We love this kitchen cart as a stylish solution for your kitchen and dining area. It features a butcher block for easy food preparation, a towel rack, wine bottle holders on the lowest shelf, a hanging stemware rack, and casters for mobility! Transitional Kitchen Cart, $145.34, available at Amazon. This drawer organizer is perfect for keeping flatware, cutlery and cooking utensils neatly organized thanks to its variety of differently sized compartments. Drawer Store Expandable Cutlery Tray, $19.95, available at Amazon. This napkin holder makes a handy spot to store and organize napkins while keeping your kitchen countertops and dining tables clean and tidy. 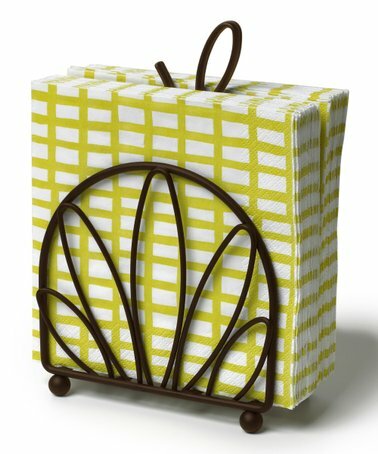 Leaf Napkin Holder – $7.99, available at Zulily. This new kind of kitchen storage solution is a clever way to stack your pots and pans, as well as your treasured cookbooks. It fits neatly in a room corner and can bear an incredible amount of stuff. Tier Knocked Down Cookware Stand – $280.98, available at Amazon. Keep sugar, flour, other powder and grain secure and organized in these storage containers. The spoon on the side makes a convenient way to scoop out your dry goods quickly. Canister Set with Spoons – $29.39, available at Amazon. Teaming up a rolling cart with a wine tasting table, this mobile bar will sit perfectly against a wall in the dining room or as a kitchen island for prepping food. Metal Wood Wine Table – $197.44, available at Amazon. Use transparent shelf boxes easily spot, sort and organize everything from packaged goods and produce in a pantry to frozen vegetables in a deep freezer. Linus Pantry Binz – from $7.99, available at Container Store. For those of you that need extra storage for your favorite spices and clearing up the counter at the same time, this spice rack is the perfect solution. It makes also a great gift to for someone who loves to cook! Orbit Spice Rack Jars & Rack – $32.07, available at Amazon. Clear up your kitchen cabinets from sturdy cookware and utensils. This wall rack is a neat solution to keep utensils and gadgets close at hand and out of the way. Don’t limit yourself to hang up pots and pans, but use it to store produce bags and dish towels as well. Rack It Up Utensil Bar Pot Rack – $58.38, available at Amazon. Protect your precious cookbooks and keep them at reading level with a convenient recipe holder. Vintage Blacksmith Recipe Holder – $34, available at Pottery Barn. Crowded drawers are not the best place to store silverware. An elegant cutlery organizer will fit stylishly in your cupboards, or on a console in the dining room. Flatware Organizer Box – $19.99, available at Amazon. This stylish stoneware utensil jar is the perfect way to keep your utensils handy for cooking. Ceramic Utensil Holder – available at Amazon. Fed up of cans stacking up and falling from your upper cabinets and pantry? This neat can organizer stores cans horizontally and allows you to group them together and quickly check what you need to buy. Can Rack Organizer – $26.57, available at Amazon.